Firstly, a little personal context – I recently wrote an article about Pinot Noir in the Hunter Valley (pg 16 of this edition of Breathe Hunter Valley) and whilst tasting wines for the article this wine stood out as a prime example of what can be achieved (whilst illustrating just how much importance Mount Pleasant played in the history of Australian Pinot Noir too). 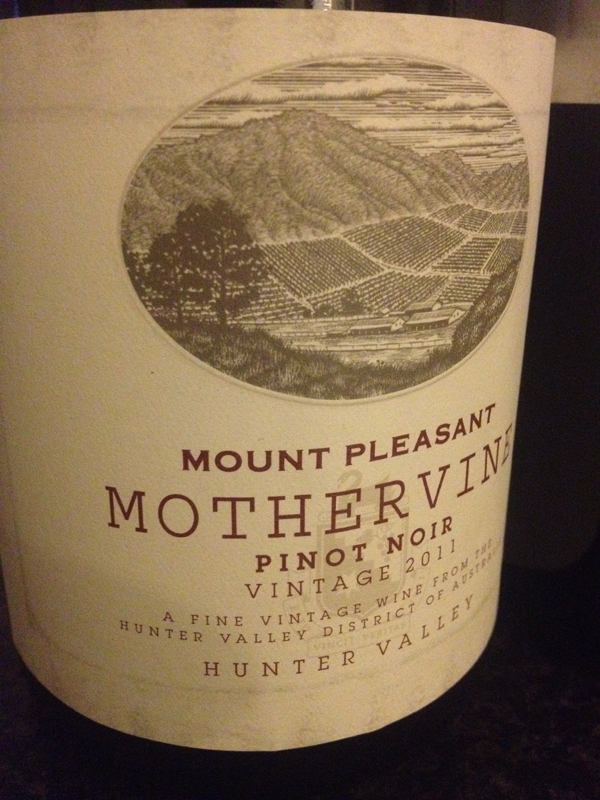 What drew me particularly to this Mothervine red is that it tasted like Pinot Noir. Not dry red wine made from Pinot Noir grapes, but actual proper varietal Pinot Noir. By that I mean that all too many Hunter Pinots taste like Hunter red first and Pinot Noir a distant second, which is fine for Hunter wine fans but is not necessarily interesting for anyone else. The production techniques used here are quite enlightened too, the fruit drawn from a block on the 60 year old OP & OH vineyard and made using an array of different treatments, including both natural and innoculated ferments, a little whole bunch action and 5 days of cold soaks. Oh and unlike much of Victoria and South Australia, the 2011 vintage was particularly strong for Hunter Valley reds. admirably clean, persistent and varietal sappy. Those black cherry fruit flavours carry through onto the palate which is also edged with light – yet proper – drying tannins. That’s a rare combination for Pinot Noir. Actually, the tannins are rather fine and Hunter-esque, sneaky even (like all good Hunter tannins are). Like. Sitting somewhere in between the dry, mid weight ‘Hunter Burgundy’ style and the high toned plushness of Central Otago, I enjoyed just how genuinely vinous this way. As it ages it will only get more complex and more interesting too. Double like.